So asks Father Flynn, the progressive and beloved priest at the St. Nicholas Church School in the Bronx, in his sermon. It’s 1964, and things are changing, to the chagrin of rigid principal Sister Aloysius. However, when an unconscionable accusation is leveled against the Father, Sister Aloysius realizes that the only way to get justice is to create it herself. In stunning prose, John Patrick Shanley delves into the murky shadows of moral certainty, his characters always balancing on the thin line between truth and consequences. 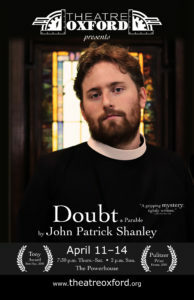 Doubt: A Parable is an exquisite, potent drama that will raise questions and answer none, leaving the audience to grapple with the discomfort of their uncertainties.